Everything you need to know about using EDIUS. More than 29 hours of material! Choose this option and, once ordered, you will be sent links to download the whole tutorial (approx. 4GB). Click here for full details of the tutorial..
Who is this version for? This version of the tutorial is for people who have had a previous version of my EDIUS 7 tutorial. The EDIUS 8/9 tutorial is full of new information but does cover a lot of the same ground as quite a few things have stayed the same between EDIUS 7 and EDIUS 9. 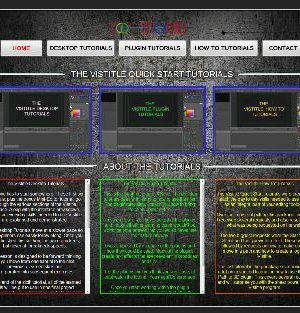 Therefore, you can buy the tutorial at half price if you have the old EDIUS 7 version. You do not have to provide any proof as I have a list of everyone who has had the EDIUS 7 tutorial. What is in the tutorial? My EDIUS tutorial disc covers all aspects of editing and using Grass Valley EDIUS and Grass Valley Mync. If you want to see a complete list of all of the chapters please click here. 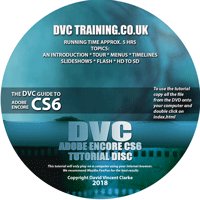 This disc starts with a section that goes through a complete edit from start to finish, and then has other sections looking at specific parts of the program. The entire tutorial lasts 29 hours and 40 minutes. When you have ordered the tutorial you will be sent links to download the tutorial. It is about 6GB in size. I have split the tutorial into several sections to make it easier to download if you have a slow internet connection. You will need to download all 10 sections. 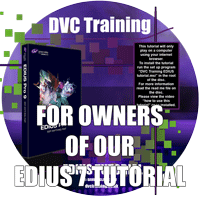 Once downloaded you will need to rename the first file from DVC_EDIUS_Tutorial.rar.part01.exe.rar to DVC_EDIUS_Tutorial.rar.part01.exe– basically removing the .RAR at the end of the file. Unfortunately I have had to do this because many anti-virus programs block you from downloading .exe files. 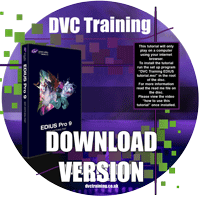 Then all you have to do is to double click on the DVC_EDIUS_Tutorial.rar.part01.exe file and it will extract the entire tutorial into the folder where you have downloaded it. You can now either just double click on the index.html file in this folder and it will open the tutorial in a web browser or double click on Install EDIUS tutorial.msi. This will then prompt you to decide to install the tutorial and put a shortcut on your desktop. You do not have to do this, it is just tidier. After you have unzipped the tutorial files there is a “readme.txt” file which explains how to install it. There is also a file in the “01_basic_edit” folder called “intro.mp4” that you can play in any media player program which explains how to navigate the tutorial. Once completed you can delete all the downloaded files. If you loose the tutorial in the future because of a hard drive problem etc please contact me and I can give you access to the files to download again. If you have problems download the files please get in touch.